You did it. You survived the holidays. The gifts you’ve been hiding in your closet have been doled out, extended family members have been hosted and humored, and your body is ready to begin its slow recovery after weeks of feasting. But nothing is really endless, is it? Time marches on until the arrival of boring ol’ January, and we find ourselves falling back into familiar routines. The party’s over. Life, inevitably, beckons. But wait, aren’t you forgetting something? Look in the corner of your living room. See that giant tree covered in glitter and ornaments? How about all those knick-knacks and trinkets lined up on your mantle? Oh, and in your front yard, are those… lights? Did you really cover your property with hundreds of tiny rainbow lights? Just who’s supposed to clean all this up? You? Yes, you. After all, you don’t want to be THAT neighbor. Y’know, the one who still has a giant inflatable Santa sagging on their front lawn at a time when honest, decent folk are celebrating St. Patrick’s Day. You’re better than that. Make no mistake, plucking each individual ornament off your tree and from around your house by hand, one by one, is no small task. But you don’t want to just throw them all in a box and call it a day, either. These aren’t just random baubles and lights; these are memories. They’re Holiday Spirit Concentrate: the fairy dust and well wishes that transform your house into a winter wonderland. They require proper care and attention so that they’re ready for next year. You’ll find many professionally-made, off-the-shelf products that will make things easier, but they can get pricey. That’s where I come in. I’m here to walk you through a few homemade projects that will not only make for a quick and easy holiday clean-up, but will also provide cost-effective alternatives to those expensive big-box products that make the same promises. Together, we will get your house in working order and ready for normal life without having to spend an arm and a leg. Glass and porcelain ornaments of various shapes and sizes are, of course, very fragile and prone to breaking. When I was a kid, Mom would wrap each one in tissue paper and then… toss them in a box. Sure, most would come out the other side unscathed, but you can bet there’d usually be one or two elves missing a foot or an ear when we opened them up the next year. 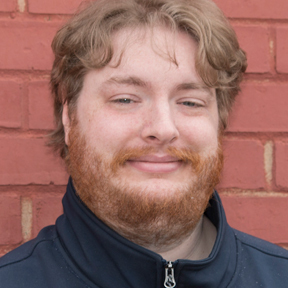 “There has to be a better way,” I’m sure you just exclaimed, out loud, to your computer screen. Fortunately for you, there is! Now, this one takes a bit of craftsmanship, but it really is the most efficient way to store those big ornaments without having to worry about them bumping into one another. What to do: Getting properly-sized materials is the trickiest part of this project. 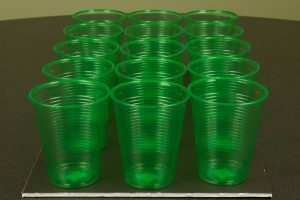 You need to make sure your cups are the right height, so that your bin can hold two layers of them. Once you’ve got that sorted out, the rest is simple. 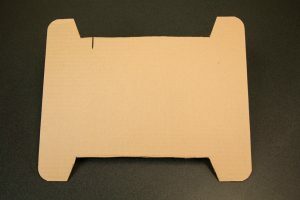 Cut the corrugated cardboard to fit the shape of the bin, place your cups on it to see how many fit, and then glue the bottom of each cup to the cardboard. Finally, you just need to repeat this process for as many layers as you have room. Two layers of cups fit nicely in this tote. 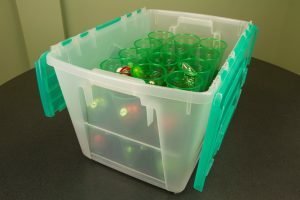 When all is said and done, you’ll have a special bin that allows you to store each ornament in its own snug, comfortable chamber. Not every ornament justifies having its own cup, though. Small hanging ornaments are common victims of the storage box. The solution to this is so easy that you’ll be mad you didn’t think of it first. What to do: Try to bear with me here. I don’t want you to get lost or confused during this process, so take a deep breath, turn off Netflix, and focus as hard as you can on what I’m about to tell you. Are you ready? Okay. Step 1: Pick an ornament. 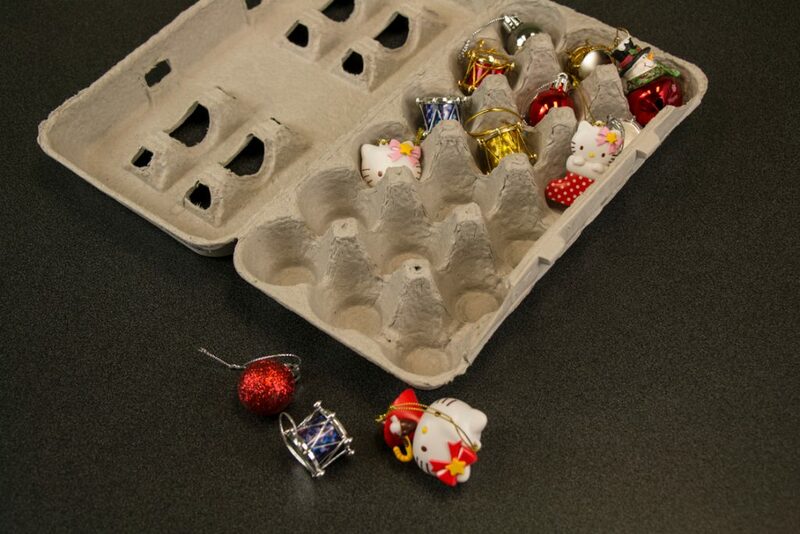 Step 2: Put ornament in egg carton. 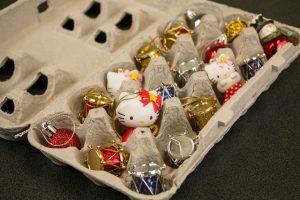 Ornaments… in an egg carton. Egg cartons. It seems so obvious, doesn’t it? There’s nothing better for transporting small, fragile cargo. 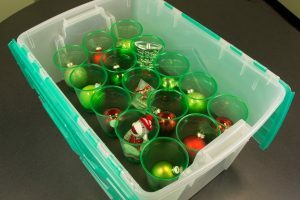 If you have a handful of ornaments that are so small and so precious that you can’t bear to throw them in with the others, then this is your best solution. I love lights. Every year, I like to drive around my neighborhood at night and look at all the houses decked out in their holiday best. There’s something magical about it, isn’t there? Something even a little ethereal. When Thomas Edison ruthlessly stole the idea for the lightbulb, did he know that his repulsive intellectual theft would yield such beautiful results? 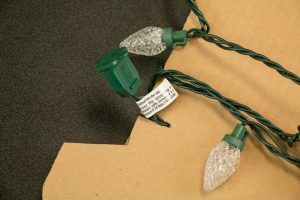 That’s all well and good, but let’s not beat around the tastefully-decorated bush: holiday lights are a pain to put away — and even more vexing to bring out later in the year. How many hours have you spent sitting on the floor of your basement, desperately untangling line after line after line of electrical wire? How many times have you thrown a stubborn knot of lights on the floor in frustration? Do you really want to do it again? What if I told you I know of a method to avoid that situation again? What do do: All you need to do is cut the piece of corrugated cardboard (or foamcore, as always) into somewhat of a spool shape. Cut a notch at the top to slip in one end of the cord, then wrap the cord around the spool until it’s all neat and bundled. 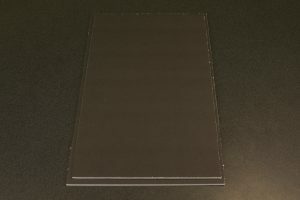 You should aim to slip the other end into that same notch, but if necessary, you can just cut another one. In my opinion, this is the most valuable tip of the lot: no more untangling knots; no more confusing ball of dozens of different cords melded together. 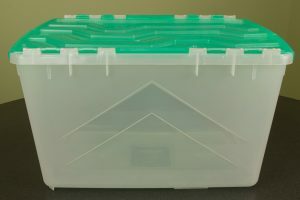 When the holiday season rolls around next year, you can unravel each light pack, one at a time, knowing that they’ll stay as tidy and organized as the day you bought them. 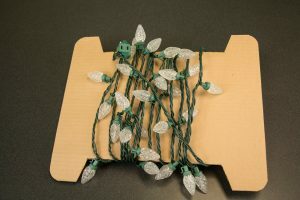 This one is actually a bit of a year-rounder, but it will definitely still help you as you clean up your decorations. From electronics as simple as a string of lights to those as complex and thought-provoking as a motion sensor-activated hula-dancing Santa Claus, our homes are full of gadgets and gizmos that approximate holiday cheer. As such, our power outlets tend to get a little crowded. This helpful tip will make sure that you don’t lose track of what goes where. What to do: Since you’re packing up your holiday electronics, now is the perfect opportunity to label them for future applications. Simply write the name of each electronic device on a bread tie, then clip those bread ties onto their respective devices. Bread ties wrapped around cord. This may not seem like a big deal, but trust me: next year, when your living room is jammed full of people, someone will want to plug something in — whether it be a moody teenager desperate to charge their phone or a goofy uncle looking to show someone a funny video on his laptop. 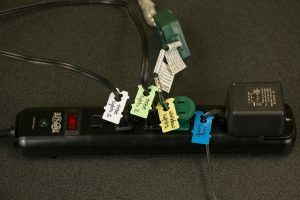 You’re guaranteed to have at least one person yanking something out of the power strip. With labels, you can at least be sure they won’t at least unplug the TV. This is another tip I plan on executing as soon as I get home today. We all have leftover decorative paper after we finish wrapping gifts. Me? I’m dumb. When I’m done with wrapping paper, I throw it out, tube and all. This is because I’m a short-sighted fool with no appreciation for arts and crafts. But you? You’re different. You’re smart, and you know the value of conserving material for future convenience. Because of these eminent qualities, I think you’ll appreciate this project. 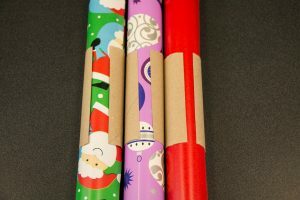 What to do: First, remove a good five-inch section of wrapping paper tube (or whatever length you’re comfortable with) and cut a slit in it. You can use this tube to keep your paper from unrolling in storage. 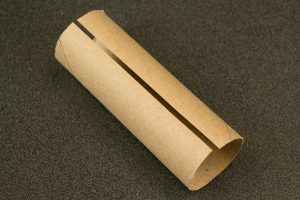 Paper towel and toilet paper tubes can also work, but some folks find the wrapping paper tube to hold better. 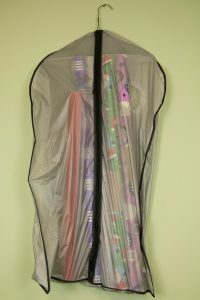 Then, you can stash the rolls of paper in a suit or dress bag and hang it in your closet. Section of wrapping paper tube. Wrapping paper tube wrapped around wrapping paper. 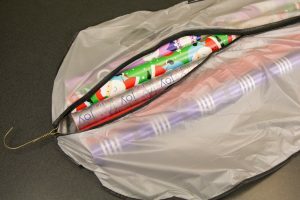 Wrapping paper packed neatly into a suit/dress bag. With this handy fix, you’ll now have an accessible collection of wrapping paper that is easy to tuck out of the way. Of course, this isn’t just useful for the holidays; you’ll be digging into this goldmine every time a birthday rolls around. Dismantling decorations for the year is a somber experience. Speaking for myself, I want to keep the magic alive in my home as long as possible. Cold winter nights can be dull and dreary without a prevalent sense of festivity to brighten things up. That said, I think that if the season weren’t so fleeting and ephemeral, it’d lose the magic that I find myself clinging to. We need to pack up those ornaments, wind up those lights, and put that festivity to rest so that we can look forward to the next time we bring it all out. Why make this experience more frustrating than it has to be? To that end, I hope you will find these tips useful as your house goes through its many holiday transformations in 2018.